As the restaurant supply superstore, we make sure to stock many different glazes for restaurants and bakeries. Coat your donuts with it or coat your pies and cakes with layers of it. Rich Honey Dip Donut Glaze - 24 Lb. Wonder Glaze - 40 lb. Glaze N Shine - 40 Lb. Aprigel Glaze Concentrated - 27.5 Lb. 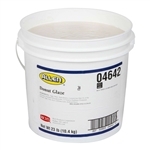 Glaze Herogel Concentrated - 27.5 Lb. Napmiroir Mirror Glaze - 11 Lb. Donut Glaze - 23 Lb. Wholesale Glaze for your restaurant and food service cooking and baking needs.